I couldn't believe my eyes - there were bodies flying through the air in fluid, clean lines, forming spiral shapes with each other. After seeing my first Aikido demonstration, I was so moved by the beauty of the movements that I went home and signed up right away for classes. I began my training in 1980 at the San Francisco Women's School of Aikido with Margie Leno Sensei. This dojo no longer exists, but at the time it was a remarkably empowering initiation into the art. Right from the beginning, I had the opportunity of being taken seriously as a woman. When I started my own dojo in 1995, it was important to me to create a space that supported women in their training, fostered mutual respect between the women and men and that was welcoming to diverse communities. For more than 30 years, Linda Holiday Sensei has been my primary teacher. She has a unique ability to convey the deeper meanings embedded in the physical movements of the art. In her dojo, Holiday Sensei stresses community building as part of training and also equality between women and men - aspects that are decidedly western innovations. My training, my teaching and my dojo leadership style are all strongly influenced by her approach to the art. Mary Heiny Sensei has also been a significant teacher for me through her frequent seminars in Northern California. 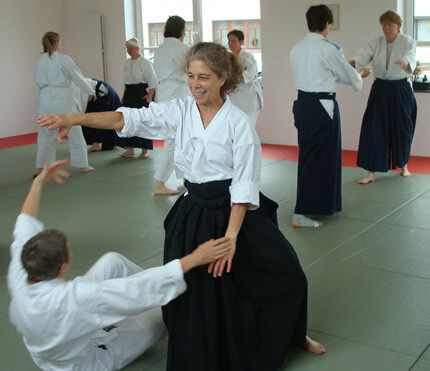 She emphasizes that Aikido is about self-correction, and not for correcting others. I find her words coming to mind often when I'm on the mat, guiding my training and my teaching. "You think that you need to do something with your feet or your hips or your shoulders, but all you need to do is to let your partner be part of yourself and not obstruct that feeling." I have been fortunate to have had many opportunities to train with Motomichi Anno Sensei, 8th dan, a direct student of Osensei, both at the Kumano Juku Dojo in Shingu, Japan as well as during his visits to Northern California. I am particularly intrigued by his teaching that Aikido should be "natural movement," a concept I continue to contemplate and explore in my practice. Did he mean relaxation? Did he mean the unselfconscious movement of animals? Did he mean being in the moment? And although I didn't know her personally and have never practiced Judo, I am inspired by the example of Keiko Fukuda Sensei, who ran a women's judo dojo in San Francisco until the day she died at age 99 in 2013. My regular bus route would go by her dojo and I'd see her through the window, sitting there in her wheelchair, dressed in a gi. This is the vision I hold for myself, of truly lifelong training, and I received it from Fukuda Sensei, just by passing by her dojo. At this stage of my training, peers and sempai in the art are increasingly significant sources of inspiration such as Clarissa Henke Sensei from Germany, Matt Fluty Sensei and sempai Peter Ralls Sensei from the Bay Area. I value lineage and I feel grateful to those who have come before me, to those who now share the path, and especially to those who will travel the path in the future. I enjoy the teaching aspect of my training. Valuing teaching as an art is something I learned from my mother, who was a high school economics and history teacher. She was interested in the shape of the learning experience and how to structure her lessons to inspire students to want to learn. I knew from an early age that teaching was a craft and a rewarding practice in itself. When I attend someone else's class, I return to my dojo with a new perspective and try to convey it to others through teaching. As a result, I learn even more. Recently, I am entering a new phase in my practice, where my Aikido background and my training as a physical therapist are coming together. I have been applying my knowledge of biomechanics to develop alternative movements for people who can no longer roll or fall. Creating different, more accessible movement forms requires me to reflect deeply on the essential aims of the art as taught to me by my teachers and sempai over the years. As I was the very first time I saw an Aikido demonstration over 3 decades ago, I continue to be spellbound by the beauty of Aikido movement. Pursuing the movement aesthetic of Aikido continues to serve as a portal for me to deeper principles of the art. Penny also runs a program for older adults to help them maintain mobility. See www.maintainingmobility.org for more information.